and all other open and closed cooling systems. ADECO company was founded in 1991 in Novi Sad. Frizantin product group have been produced since 1993 . All products are manufactured from the highest quality raw materials from renowned European petrochemical manufacturers and all product are quality controlled by accredited laboratories. FRIZANTIN G40® is an engine coolant concentrate based on ethylene glycol and corrosion inhibitor package (Si-OAT technology). It is intended for the latest generation of vehicles with cooling systems produced on the basis of aluminium and light metals, that needs to be diluted with water before use. Protects engines from overheating in summer and freezing in winter. It effectively protects engines against corrosion and deposits in the cooling system with its vital parts, the coolant channels in engine block and cylinder head, the radiator, the water pump and the heater core.FRIZANTIN G40® should be blended with water in a concentration amongst 33 to 60% by volume prior to infilling. The usage of a 50/50 ratio for the mixture of water and FRIZANTIN G40® is generally advisable. This product meets specifications of product G12++. Fluorescent pink colored, concentrated coolant of Monoethylen Glycol base, designed for the latest generation of motor vehicles, with cooling systems produced on the basis of aluminium and light metals, which must be diluted with water before use. 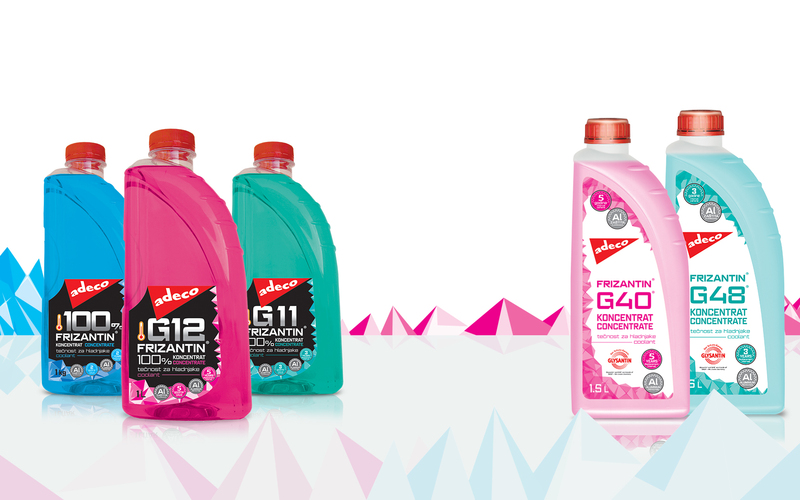 Adeco FRIZANTIN G12 provides maximum protection from freezing in winter and from overheating in summer. Provides improved protection against corrosion of all metal parts, especially aluminium parts, fittings, hoses, plastic parts of refrigerators, etc. Prevents formation of foam and lime deposits. Guarantees improved heat transfer, providing for increased engine flexibility and maximum reliability to users. It is suitable for use in open and closed cooling systems. Does not contain nitrites, amines, phosphates, borates and silicates. A special additive package provably provides extended coolant drain interval of at least five years, e.e. 650.000 km (8.000 hours of operation) in heavy off-road vehicles, 250.000 km (2.000 hours of operation) in passenger cars and light commercial vehicles, and 32.000 hours of operation (6 years) in stationary engines. Prepared Monoethylene Glycol based coolant of fluorescent pink colour, designed for use in the latest generation of motor vehicles with cooling systems produced on the basis of aluminum and light metals, which is used without dilution with water. Adeco FRIZANTIN G12 -40 provides maximum protection from freezing in winter and from overheating in summer. It provides improved corrosion protection of all metal parts, especially aluminium ones, fittings, hoses, plastic parts of refrigerators, etc. It prevents formation of foam and lime deposits. It guarantees improved heat transfer, providing increased engine flexibility and maximum reliability to users. It is suitable for use in open and closed loop cooling systems. It does not contain any nitrites, amines, phosphates, borates or silicates. A special additive package provably provides extended coolant drain interval of at least five years or 650.000 km (8.000 hours of operation) in heavy off-road vehicles, 250.000 km (2.000 hours of operation) in passenger cars and light commercial vehicles, and 32.000 hours of operation (6 years) in stationary engines. Concentrated Monoethylene Glycol based coolant of green colour, in combination with the hybrid additive package (HOAT), intended for the protection of cooling systems of motor vehicles which must be diluted with water before use. Adeco FRIZANTIN G11 is suitable for use in open and closed cooling systems. It provides maximum protection from freezing in winter and from overheating in summer. It provides improved protection against corrosion of all metal parts, especially aluminium part and it is compatible with elastomers. It prevents formation of foam and lime deposits. It guarantees improved heat transfer, providing increased engine flexibility and maximum reliability to users. It does not contain nitrites, amines, phosphates. It meets the highest requirements in terms of corrosion protection in thermally highly loaded engines made of steel and aluminium. A special additive package provably provides extended coolant drain interval of at least 3 years or 120,000 km. Concentrated coolant formulated for cooling systems of motor vehicles. Produced on the basis of Monoethylene Glycol and a special additive package. Before use must be diluted with water according to the table of dilution ratio. Protects the motor from overheating in summer and freezing in winter. Adeco FRIZANTIN 100% provides excellent protection against corrosion of all metal parts of the cooling system of motor vehicles. It is designed to fully meet the high demands for additional protection of all aluminium engine parts from corrosion. It can be also used in other open and closed cooling systems. The recommended drain period is two years or according to engine manufacturer. It can be mixed with other coolants produced on the same basis. A coolant of blue colour, prepared for cooling systems of motor vehicles, produced on the basis of Monoethylene Glycol and a special additive package. Protects the motor from overheating in summer and freezing in winter. Does not freeze above the temperature of –40oC. Provides excellent protection against corrosion for metal parts of the cooling system of motor vehicles. Adeco FRIZANTIN -40 is designed to fully meet the highest requirements for additional protection of all aluminium engine parts from corrosion. It can be also used in other open and closed cooling systems. The recommended drain period is two years. It can be mixed with other coolants produced on the same basis. Liquid produced on the basis of high quality and specially selected Alcohol and Glycol, which enables normal operation of the air system of motor vehicles at very low temperatures and high humidity. It enables normal operating conditions down to -50oC. Adeco FRIZANTIN VS -50 is designed for air brake systems of buses, trucks and similar vehicles. It is used in all brake systems with air pressure throughout the year. It is installed in a specially designed vehicle tank, the level of the fluid is to be checked regularly and refilled when necessary. Colourless concentrated coolant based on Monoethylene Glycol, intended for heating systems (central and distant) produced both on the basis of cast iron and on the basis of aluminium and light metals, which must be diluted before use with water. It is used in central and distant heating systems, which are heated with water. The use of Adeco FRIZANTIN THERM prevents frost. It can also be used in circular cooling system, in floor heating systems, in ice rinks, as well as for heat pumps in machines for blow moulding of containers. It can be also used in solar systems where contact temperature does not exceed 100°C. IT MUST NOT BE USED IN FOOD INDUSTRY!!! Ready to use, colorless, monoethylene glycol based coolant, designed for heating systems (central and floor) produced both on cast-iron basis or aluminum and light metal basis. It is used in the heating system, which is heated with water. The use of ADECO FRIZANTIN THERM-25 provides freezing protection down to -25C. It is used for circular cooling systems, for underfloor heating systems, for skating rinks, as well as for heat pumps for blowing machines. It can also be used in solar systems where the contact temperature does not exceed 100C. Provides an extended replacement interval of at least 10 years. Concentrated Propylene Glycol based heat transfer fluid for use in heating and cooling systems. It contains high-performance corrosion inhibitors, each of which is adapted to the type, design and material of the equipment in which it is used. This ensures superior reliability and long service life. Adeco FRIZANTIN EKO 100% offers maximum protection against corrosion, freezing and collecting dirt. It forms a stable compound with water, so that it can be mixed with water in all ratios. It meets contemporary standards of environmental protection; it is biodegradable and does not pollute the water. It does not contain nitrites, phosphates or amines. It is non-toxic and not harmful. Experiences of coolant (antifreeze) manufacturers have shown that the demand for antifreeze agents significantly increases with the occurrence of the first colder days. Since throughout the year the cooling systems of internal-combustion engines (ICE) should contain antifreeze of a required quality, this fact is denying that. Our intention is to use these pages to remind and educate customers how to properly use coolants. The term antifreeze refers to a liquid of low freezing point and high boiling point, placed in the cooling system of internal-combustion engines which is used to lower the temperature of the IC engine, i.e. to maintain the engine in the optimal temperature regime. Coolants can be used in other open and closed cooling systems as well, for which the cooling system manufacturer has recommended the use of these products. - Improved heat dissipation and thus better system cooling. Coolants consist of a base fluid, additives and water. The base fluid, which is used in the production of coolants for motor vehicles, agricultural and construction machinery is monoethylene glycol (MEG). Monoetilenglycole is the most important component of coolants. This compound determines the boiling point, freezing point and the heat transfer properties of coolants. The freezing point of water and monoethylene glycol is inversely proportional to the concentration of monoethylene glycol, but only up to 60% concentration. Additives are obligatory components of coolants because only MEG, without additives, is highly aggressive, causes corrosion of ferrous and nonferrous metals. Therefore, multifunctional additive package containing: corrosion Inhibitor, cavitation Inhibitor, deposition inhibitor, defoamer, stabilizer, and buffer (maintains constant pH value) has to be added into MEG. - Maintain pH value of antifreeze within the prescribed values of 8 to 11 (base). - Organic antifreeze (OAT) or G12 + (Long Life): change interval of this antifreeze is five years. - The basic raw material for the production of antifreeze (MEG) is toxic, so antifreeze is itself highly toxic. Therefore, in the production of antifreeze a component is being added that makes the taste of the antifreeze bitter, in order to prevent any potential swallowing. - Due to these properties, it is recommended that the cooling system always contains a coolant of the quality recommended by the manufacturer of the cooling system or the engine. - Mixing of coolants of different qualities is not recommended. - Bear in mind the change interval of antifreeze because the additives in coolants lose their original properties (wear out) over time, they become acidic and aggressive. Each antifreeze has its own lifecycle. You can contact us by phone during work hours or by e-mail at any time. You can contact us by email using the contact form.